Regularly drinking cranberry juice may help control blood pressure, according to new findings presented at the American Heart Association’s High Blood Pressure Research 2012 Scientific Sessions. 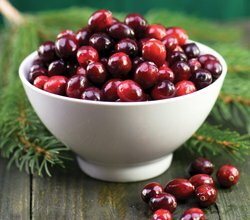 Cranberry juice, the researchers note, is rich in antioxidants—naturally occurring molecules that have been associated with the blood pressure-lowering benefit. U.S. Department of Agriculture researchers discovered a moderate systolic pressure reduction—about three points—for people that drank two eight-ounce glasses of cranberry juice every day for eight weeks. Because of the sugar calories in juice, consider the alternative of a whole-food cranberry supplement.